As three of the four remaining Doolittle Raiders honored one another with a toast Saturday, Nov. 9, veterans, active-duty members, family and friends toasted to the Raiders’ last gathering at the American Veterans Center annual awards gala in Washington, D.C. The 80 men who risked their lives on a World War II bombing mission on Japan after the attack on Pearl Harbor were honored in Ohio with a wreath laying ceremony and a B-25 flyover that morning, followed by the toast at the National Museum of the U.S. Air Force. Hennessy donated 48 bottles of cognac to the American Veterans Center event, just as the three Raiders sipped cognac from specially engraved silver goblets — the 1896 cognac was saved for the occasion after being passed down from Doolittle. “We have a very special relationship with the Doolittle Raiders,” said James Roberts, president of the AVC. “They have established the Doolittle Raiders [Wings of Valor] Award with us, and this year the award is being given to Col. [George] Bud Day,” Roberts said. Day’s wife Doris and son George, Jr. accepted the award on Day’s behalf. Day, a Medal of Honor recipient who spent 5½ years as a POW in Vietnam and was Sen. John McCain’s cellmate, passed away earlier this year. “The Raiders have basically entrusted their legacy to us with this Doolittle award, and we’ll be presenting that for years to come even after they’re gone,” Roberts said. 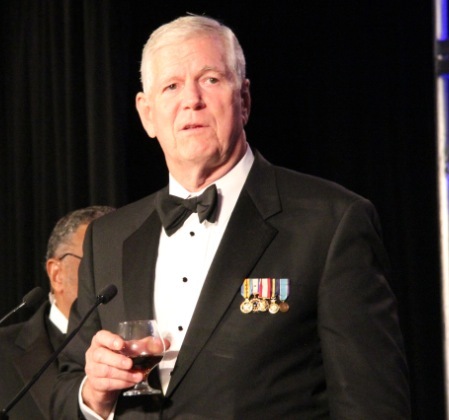 Retired Air Force Gen. Richard Myers gave the toast at the end of the gala. 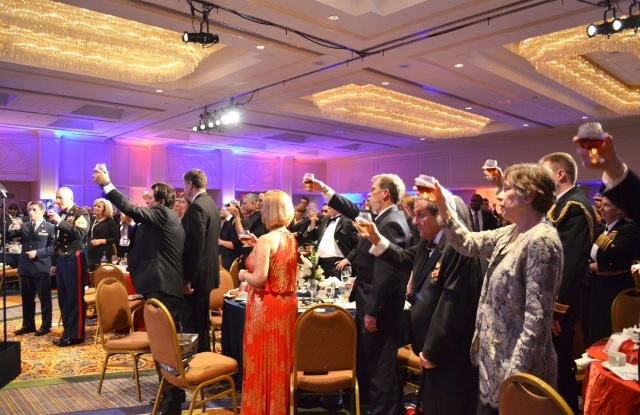 Gen. Myers toasts the Doolittle Raiders Saturday, Nov. 9, at the American Veterans Center Honors gala in Washington, D.C.
“There’s a lot of history with the Doolittle Raiders — I’m honored to [present this toast], but to be honest, a bit nervous to do justice to the Doolittle Raiders…to what they did,” Myers said beforehand. The fourth surviving Raider, Lt. Col. Robert Hite, 93, couldn’t travel to Ohio because of health problems. The American Veterans Center, a non-profit educational foundation dedicated to preserving and promoting the legacy of military personnel, held its 16th annual conference Veterans Day weekend, with the annual awards gala rounding in about 425 guests. Nine awards were given to 10 selected honorees; two of the awards were given posthumously. JROTC and ROTC students in the area as well as West Point and Air Force Academy cadets and Naval Academy midshipmen were also invited. “It’s an honor to know and to get to know these heroes,” Roberts said. The Americans Veterans Center Honors event will air around the world on The Pentagon Channel Nov. 16th and 17th. Watch the Raiders’ final toast in Ohio.